Danielle de Barbarac, the central figure of the musical Ever After, isn’t the typical fairy tale heroine. She isn’t looking for a man to sweep her off of her feet or rescue her — frankly, she has other interests. This revisionist take is one of the more defining elements of the production, now running at the Alliance Theatre through February 17. It’s a lavish, expensive work but one that sadly doesn’t have many dimensions other than a few memorable numbers and a superlative cast. The first show on the new $32 million renovated Coca-Cola Stage at the Alliance, Ever After is based on the charming, well-liked 1998 Drew Barrymore movie, itself based on Cinderella. As the musical opens, Danielle (Sierra Boggess) is living with Baroness Rodmilla de Ghent (Rachel York) and her two daughters, Marguerite (Jenny Ashman) and Jacqueline (Rachel Flynn). Danielle’s father has died, and she has become a servant to the others at the estate. Rodmilla and Marguerite are nasty to Danielle, but at least Jacqueline is nice. Meanwhile, Prince Henry (Tim Rogan) has his own problems. He is scheduled to marry Princess Gabriella of Spain in a marriage arranged by his parents, King Francis (Chris Kayser) and Queen Marie (Terry Burrell). 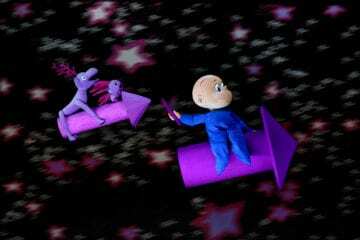 To avoid this fate, he decides to run away. 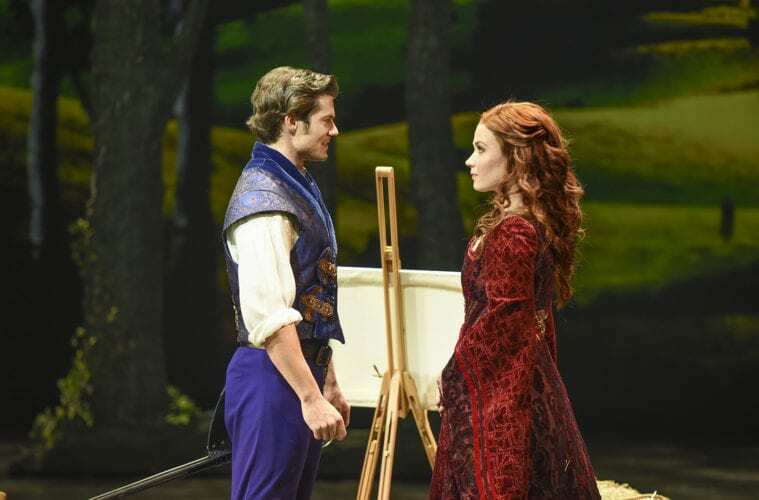 The prince and Danielle have a chance meeting in the forest as he tries to steal a horse, but he doesn’t notice her. Their second encounter, however, comes when Danielle has donned a dress and pretends to be a noblewoman; only then does the prince start to take an interest. The fact that she doesn’t show an immediate interest back makes his courtship more challenging and urgent. As was the case with the film, Leonardo Da Vinci (played here by David Garrison) is also a character, here to serve as a fairy godmother type and dole out advice. 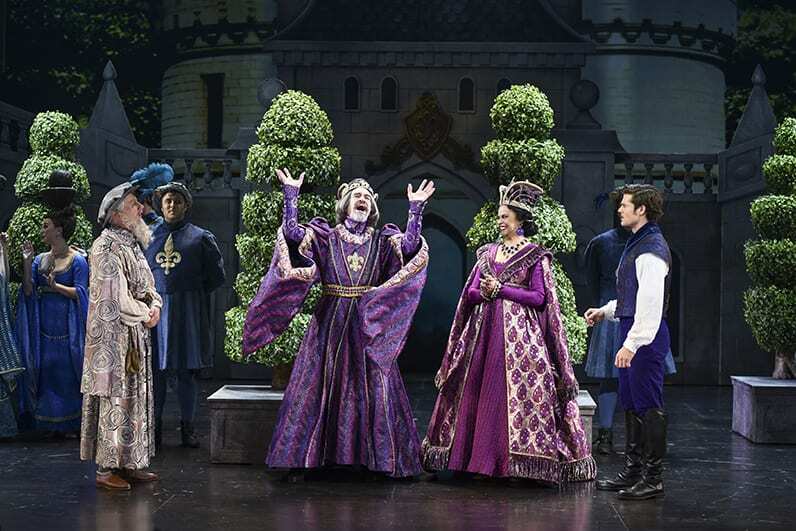 In development for a long time, Ever After premiered at New Jersey’s Paper Mill Playhouse in 2015 with a Broadway-heavy cast (including Christine Ebersole as Rodmilla) and directed by Kathleen Marshall. It’s been tweaked here and there since. Marcy Heisler has given the book something of its own identify while retaining much of the essence, but it still feels a bit flat. The score by Marcy Heisler and Zina Goldrich is largely forgettable. The show tries to spread the wealth and give most everyone a big number, but the songs just don’t pop. They mostly move the story along. A few of the numbers are pleasant, including “Who Needs Love?,” which Danielle sings early on, establishing her independent streak. Yet the only real spark comes with “Hail the Bohemian Queen,” which is richly choreographed by JoAnn M. Hunter and features some terrific dancing. It’s certainly the highlight here. Director Susan Booth brings some vigor to this, but she can only do so much. The show has a lot of jokes, endless silliness and a likable willingness to please, but it never finds its footing. It’s not the campy delight the movie often was, nor does it feature characters to root for. Booth’s large cast is certainly a talented one, with a mix of New York performers and local ones. They all work hard. Kayser and Burrell as the prince’s father and mother are charming, even if they don’t have much to do. It’s also wonderful seeing Jeff McCarthy, who starred in Urinetown on Broadway, onstage as Pierre Malette. York fills in for a role memorably originated by Anjelica Huston in the movie. 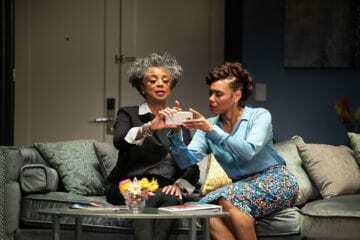 A second act number gives the character some degree of layering, but other than that, the actress isn’t able to offer more than a stock villainess. 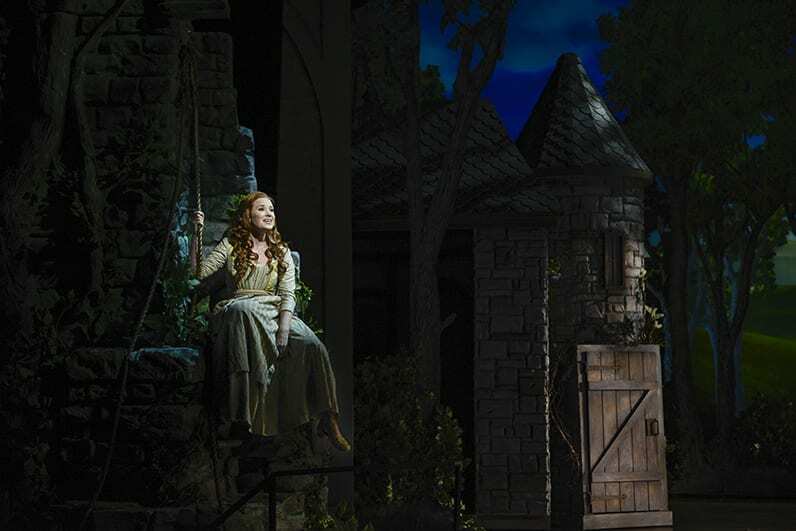 As Danielle, Boggess, who starred in The Little Mermaid on Broadway, proves again she’s got both superb acting and vocal chops. She’s often a magnetic presence. In Heisler’s hands, though, the character’s vulnerability rarely comes through — and the musical needs that. Although the actor is immensely talented, Rogan’s prince is rather generic. What really stalls the central romance is that there’s no real chemistry between the two performers, no passion that leaps off the stage. It’s nice to have the Alliance main stage back, but I wish something else had been programmed in this musical’s place. As a stand-alone offering, Ever After would be unthreatening but soft. As the opener of the new Coca-Cola Stage, though, it seems especially underwhelming, a technical triumph (special kudos to Linda Cho’s costume designs and the 15 musicians who plow through the heavy score) but a narrative and musical disappointment. If Ever After wants to head down the same route as the Alliance’s 2016 musical The Prom — currently running on Broadway — it’s going to need some fairy tale magic.